The LA Unified board today put itself on record as opposing a proposal that originated with the Eli and Edythe Broad Foundation to expand the number of charter schools in the district in the years ahead. By a 7-0 vote, the board made it clear that it would do what it could to discourage the effort by the Broad-affiliated group, Great Public Schools Now, to grow what is already the largest charter school population of any school district in the country. At the same time, the board vowed to intensify efforts toward improving educational opportunities within traditional district schools as a way to discourage more students from moving into charters. 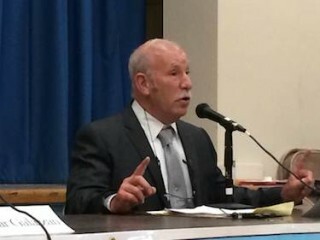 The vote followed a lengthy and sometimes passionate debate in which the board’s vice president, George McKenna, emerged as a surprise supporter of charter schools as an option to traditional schools. Rarely has any member, apart from Mónica García, expressed such unvarnished support for the role charters play in LA Unified. Underlying the board’s discomfort over the charter plan is the district’s slowly declining enrollment, a trend exacerbated by the appeal of charters to many parents. Even now, tens of thousands of LA Unified students are on charter school waitings lists. For months, the district has been struggling to develop ideas on how to stem the outflow. A spokesman for Great Public Schools Now said the group would have no response to passage of the resolution. A major point within the debate was whether to keep the language general or to specify Broad as the originator of the plan that has roiled the district since it was introduced last summer. It was revised late last year to include support for some district schools as well as charters, in part as a response to harsh public reaction. Prior to the debate, a parade of supporters and detractors made their sentiments known to the board members. A group of charter school employees expressed support during a morning meeting, and opponents, including the district’s labor partners, criticized the plan later in the day. Earlier in the day, the board unanimously passed a Ratliff-sponsored resolution that called for making charter schools as transparent in providing information to parents as traditional schools are required. Sarah Angel of the California Charter Schools Association said although she wasn’t thrilled with Ratliff’s resolution, there was more cooperation in working with Ratliff to refine her resolution than there had been with Schmerelson, who did not meet with the association in crafting his measure.